Some people have a problem with guitar intonation. I don’t mean just the struggle to get the 6 strings in tune with each other, I mean the accuracy of the the notes and intervals from fret to fret, string to string. Guitars have been around for quite a while now and guitar players have learned to live with it, but an accurate measurement of the pitches and harmonies would definitely show up compromises and discrepancies. For most of my life I’ve been perfectly content with the idiosyncrasies of the guitar fingerboard, and anyway I wasn’t aware of any other choices. That is, until now. 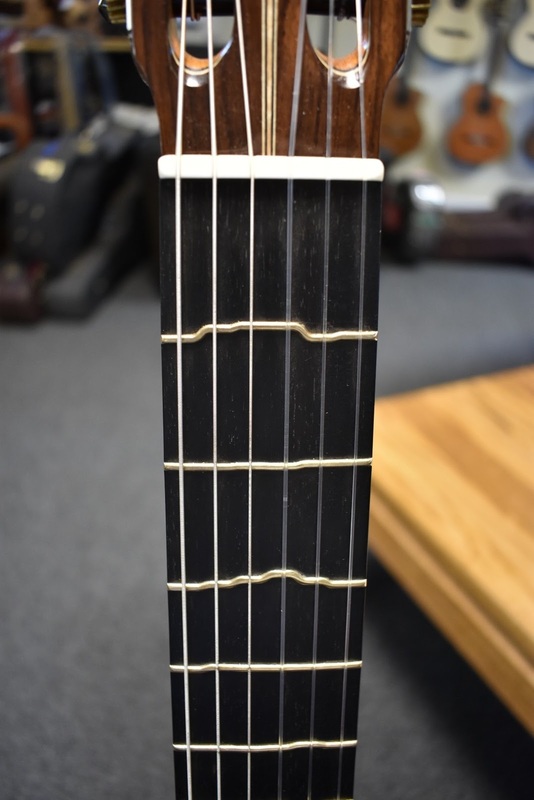 The True Temperament fretting system is a special development by Anders Thidell from Sweden. Several years ago my good friend Johannes Moller gave me a TT fretboard and frets that had been passed to him by the manufacturer. Johannes is also Swedish and a very prominent guitarist and composer and a clever and forward thinking fellow. I guess he figured I have tried a lot of progressive and innovative and weird things over the years, so why not give it a shot? That first TT fingerboard and frets sat around in my shop for at least two years until I finally built a guitar with it on a whim. To be honest, I probably put it off because I thought it was a dead-end idea. I’m certainly very aware of the conundrum of guitar intonation and the compromises we learn to live with, but as a guitar player for over 50 years I’ve accustomed my ears to the reality of guitar intonation and I’m fine with it. In some ways I feel that the quirks and “imperfections” of the guitar are part of what makes it so lovable. Nevertheless, that first TT guitar was really sweet. It was completed just before the Namm show, we took it with us to the show and it sold immediately. I barely had a chance to get acquainted. So with that tease I worked around trying to acquire more TT fretboards. 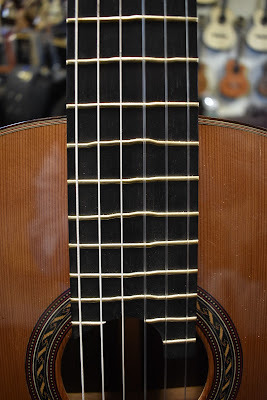 It took quite a while to make a good connection with True Temperament but eventually I did get some more of these fingerboards and last year I made another similar guitar, which turned out just as sweet. Both of those guitars were Performance Model 650 scale, both spruce double top and both really delicious. Quite a few professional players tried out the second one and used it in performances, and everyone agreed there is something magical about it. So after these glimpses of this magic I decided to build one for myself. This way I could live with it in my daily routine of guitar stuff, practicing, performing, studying new pieces etc. I’ve gotten hooked on my Ergonomic designed Signature guitar, so that’s what I wanted, a Signature, Ergonomic, True Temperament cedar top with a Barbera pickup, all the bells and whistles. We made one, and I love it. I’ve been playing this guitar for about 6 months now. I suppose I now have more experience with True Temperament on classical guitar than anyone. Over the years I’ve been willing to try many modern and sometimes controversial things in guitar innovation, and this one I was skeptical about. Because it’s so unusual and provocative looking, I kind of didn’t want it to be so good. But it is. I don’t fully understand what’s going on with it, or the math and engineering that went into it’s invention. 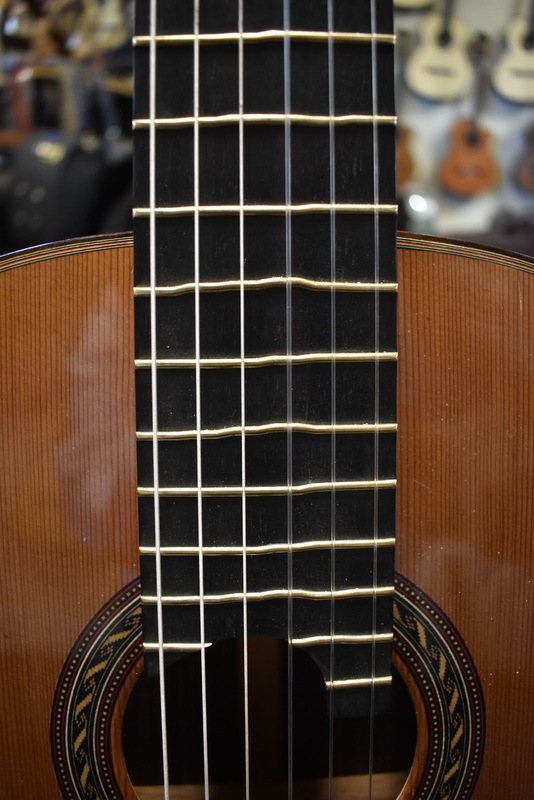 I do understand that although the fret position formula may be mathematically correct, the differences in the behavior of the individual strings because of their materials and design introduce a whole set of variables. And I understand that each individual note on the fingerboard is defined by it’s own beat-per-second frequency that can be measured, and if each note on each string were to have it’s own little fret, it might tune up more like a keyboard, but it would be pretty darn complicated. These curvy frets accomplish something like that in a dramatic but fairly practical way. I’ve read the FAQs TT has published, and I’ve thought about it a lot as I listen to it. I have a pretty good ear and can tune a guitar reliably and quickly. That’s not an issue. What I experience with the TT guitar is not so much a dramatic difference in tuning, but rather a lovely fresh purity to the sound, like extra fresh air and crystal clean water. It seems the various intervals are in greater harmony with each other, and the overall resonance is at greater peace and vitality. 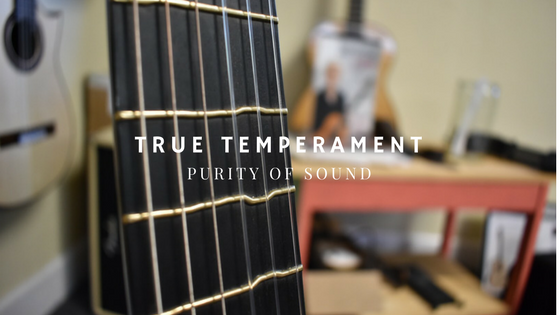 As I said, I’m not deeply bothered by the intonation of a traditional fretboard, but I am very excited about the overall countenance of the sound that comes out of my True Temperament guitar. This is not a mode, or a different twelve note temperament — it’s good in all keys, it sounds good all the way through my repertoire. And in spite of the wacky visuals it’s not hard to play for the left hand, there is no adapting of technique, that’s just not a problem. Frankly the only downside to it is that it looks so unusual and provocative. It’s eye catching in a woozy way and I wind up having to try to explain it to people all the time. Since I am interested in it myself, I don’t mind talking about it, it helps me think about it and grow into some kind of broader understanding. But until it is much more common, it will be a topic of chit chat with customers and at any gigs that I play for a long time to come. We’ll be making another True Temperament guitar here in the next few months. With three of them under my belt now and more to come, I’m convinced that this is a real option for players with a certain kind of discerning ear. I doubt that will become an industry standard any time soon, but for my own personal use I think it will be my choice for some time to come.